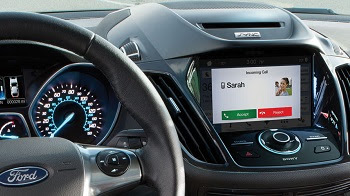 New Delhi : The Ford Motor Company, will be offering support for Apple’s Siri Eyes-Free voice activated tech through the company’s Ford Sync software that is currently available in more than 5 million ford vehicles. The service will work via an iPhone with Sync entertainment and communications system being the mediator to send and receive audio from a car to an iPhone and vice versa. Siri can be activated in a Ford car with the help of a hardware button. With new Siri, you can do everything without touching your phone including sending text messages, making phone calls, getting directions, playing music, setting reminders and checking the weather. The new Apple's CarPlay has been accessible to some drivers for a while now. Owners of cars manufactured form 2011 onwards equipped with MyFord Touch (also known as SYNC in some regions) will be able to download the update form the Ford's website. Apple has listed Ford as one of their partners in this new initiative, but as pointed out, the latest heard on a CarPlay-equiped Ford vehicle was that it would be arriving relatively soon. sers who successfully connect the same will be able to use Siri from their smartphones without the need to reach out for the smartphone. This includes commands like reading text messages, replying to them, making phone calls, getting directions, changing music tracks etc.